I'm proud to say that our award-winning Donor Recognition Art appears this week on the front page of the McMorrow Healthcare Facilities Management Report. we created for St. Mary's Hospital in Grand Junction, CO. The complete text of the McMorrow article appears at the top of their Featured Products page. How nice to see Donor Recognition getting recognized! Love of glass and love of gratitude combined this week in a blog post by Patricia Linthicum in her "Designers on Design" column on the Decorative Glass Magazine website. Patricia contacted me with the wonderful idea of doing a blog this week about giving thanks in glass, and asked me about our work creating luminous carved crystal Donor Walls and Tributes that express gratitude to an institution's generous benefactors. I talked with her about my belief that each donor gift is an "act of light" intended to heal, inspire, illuminate, or educate, and that I see our illuminated crystal Donor Walls as acts of light that are given in return, "completing" the circle. To me -- and to the men and women who work at Amri Studio -- each piece of carefully designed and carved glass we create is an act of devotion and service — an " act of light" that literally illuminates others' philanthropic and educational acts of light. In her post, Patricia featured the stunning Naming Donor Tribute we created for Florida Hospital Cardiovascular Institute (pictured above, on her blog) and I explained the multi-level symbolism of the spiral-shaped "Donor Wall" we created. To enjoy Patricia's full post, click here. We’re excited! We’ve just had our work featured in the May issue of Signs of the Times magazine. You can see the page online by clicking here. Senior Associate Editor Steve Aust did a very nice piece – with photos -- on our Donor Recognition Wall in the Marriott Library at the University of Utah in Salt Lake City. 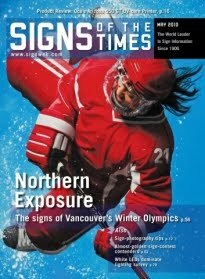 Signs of the Times, which has been publishing since 1906, aims to educate and inspire graphics and signage professionals worldwide. We're honored to be in their pages!